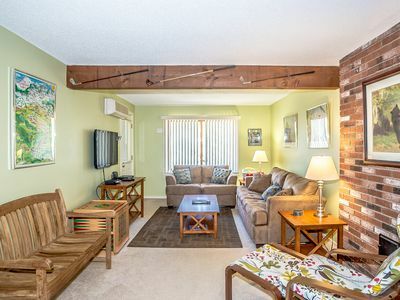 4-Season Bartlett Condo - 1 Mi. to Attitash Mtn. 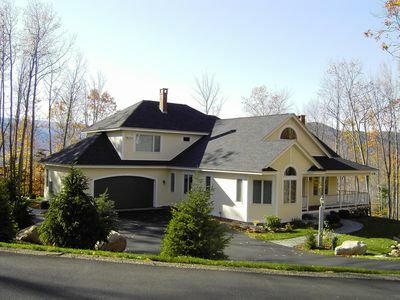 Tucked in the woods of the Mount Washington Valley, 'Black Bear Lodge' offers 10 guests a rejuvenating stay in Bartlett! 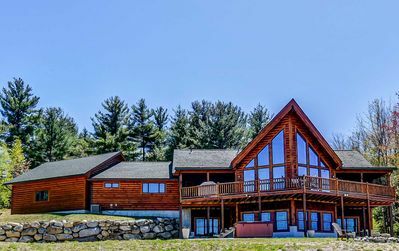 The 4-bedroom, 3-bathroom vacation rental condo boasts an expansive wraparound deck and seasonal pool access 1 mile from Attitash Mountain Resort! 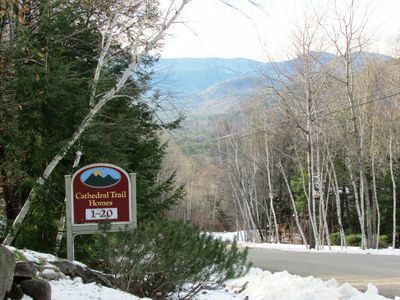 The charms of North Conway are only 11 miles away with more White Mountain skiing at Bretton Woods, Wildcat Mountain and Mt. Cranmore! Vibrant fall foliage, Santa's Village and Story Land are never far away! 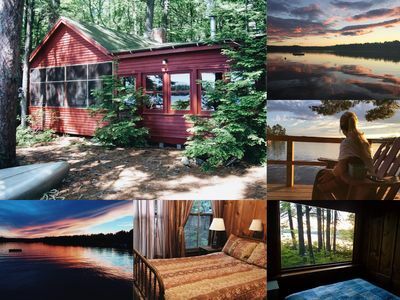 Year-round White Mountain relaxation awaits at 'Black Bear Lodge'! Mature trees provide tranquil surroundings for you to unwind in when you're not out exploring all that the area has to offer. 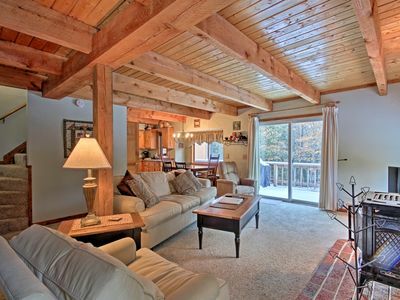 The living area on the main floor features open beams, brick accents and a gas stove to keep you warm in all seasons. Watch a movie on the flat-screen cable TV as you kick back. In the summer, the expansive wraparound deck offers a restful space to unwind. 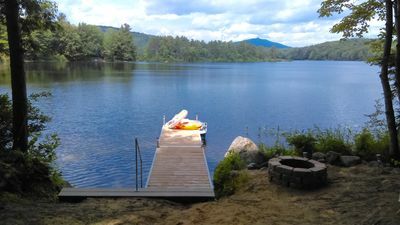 After a relaxing summer day out tubing on the Saco River, return for a relaxing dip in the community pool! Back at 'Black Bear Lodge,' throw some burgers on the gas grill and dine al fresco. Inside, the fully equipped kitchen features wraparound counters, ample storage space and a gleaming hardwood dining table. 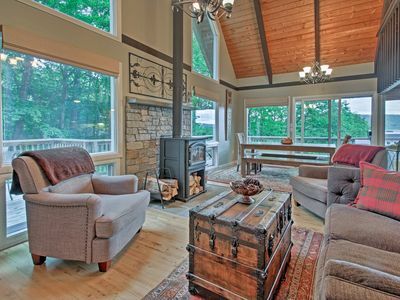 End each day in the finished basement, which boasts a sectional couch and a wood-burning Vermont Casting stove. Play a few rounds on the air hockey table or take it easy in front of the flat-screen cable TV as you wind down for the night. When it's time to call it a night, retire to one of the 4 bedrooms to get ready for bed. 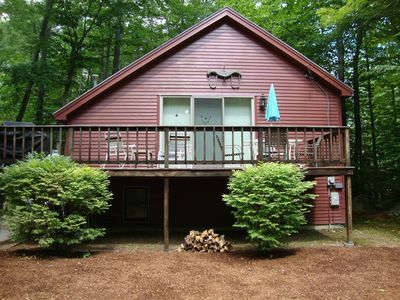 Each level of the 3-story home boasts a full bathroom for you to wash up in before crawling into bed. You'll wake refreshed and ready for another exciting day! Unbeatable skiing opportunities await just 1 mile from 'Black Bear Lodge' at Attitash Mountain Resort! You'll only have to travel 12 miles to hit the slopes at Cranmore Mountain Resort, 19 miles to visit Wildcat Mountain and 21 miles to experience Bretton Woods. In under an hour, you can also visit Sunday River, Cannon Mountain and Loon Mountain! An 11-mile drive will take you to North Conway, where delicious dining awaits at Horsefeathers, Margarita Grill and MOAT Mountain Tavern! 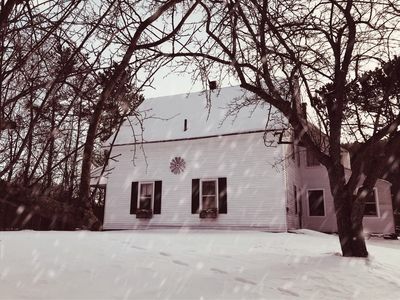 After a day experiencing the delights of Story Land in nearby Glen or Santa's Village in Jefferson, savor a refreshing drink and savory dinner at The Red Parka Pub. No visit would be complete without a ride on the Conway Scenic Railroad. Take advantage of the tax-free setting and get in some outlet shopping at Settlers Green Outlet Village. You'll find the perfect souvenir to commemorate your trip in Zeb's General Store! 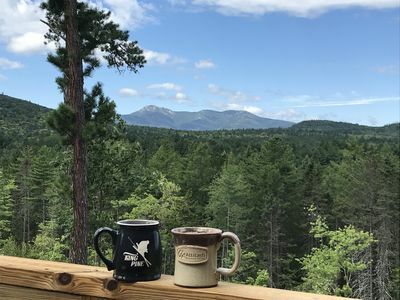 Endless hikes await in White Mountain National Forest, to waterfalls, Diana's Baths and Echo Lake! 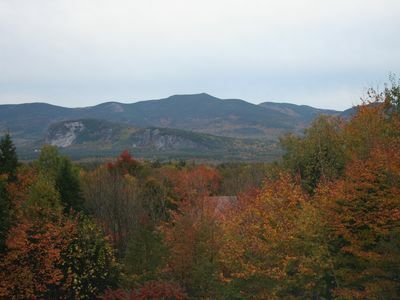 In the fall, don't miss the vibrant autumn colors along the trails and on scenic drives on the Kancamagus Highway, or the Pumpkin People in Jackson! 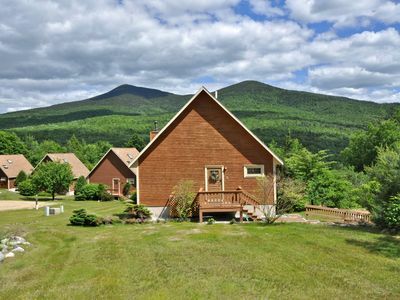 - Tranquil Bartlett location in the Mount Washington Valley with access to White River National Forest, North Conway, Story Land and skiing at Attitash, Bretton Woods and more! 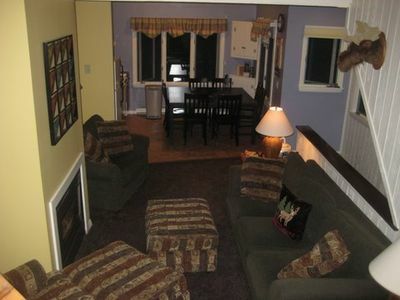 3BR Near Storyland w/ Mtn View, Deck, Central AC, Cable, WiFi & Pets Welcome! 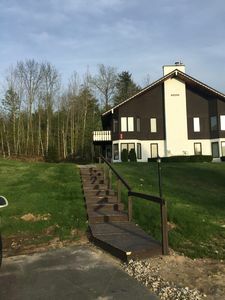 NEWLY UPDATED 2BR Condo at Attitash - PERFECT LOCATION - WALK TO ALL!!! 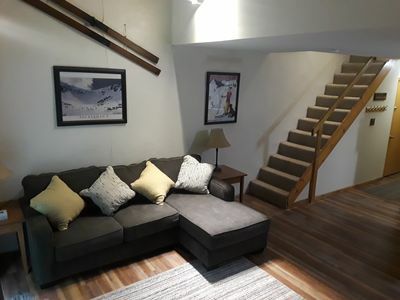 Slopeside at Attitash Townhouse - 3 bedrooms, 2 baths, sleeps 10! 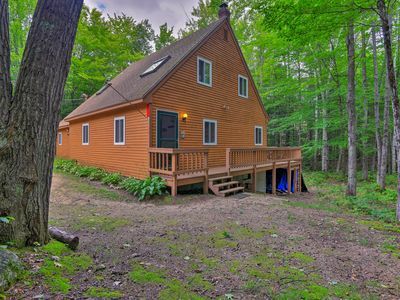 Cozy White Mountain Home - 5 Mins to Attitash Mtn! 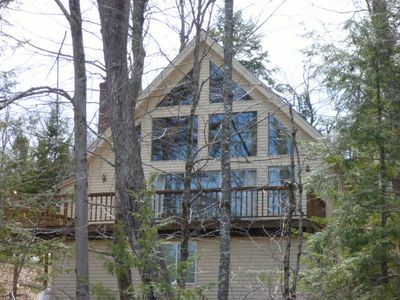 Charming Waterfront Cabin On Conway Lake! 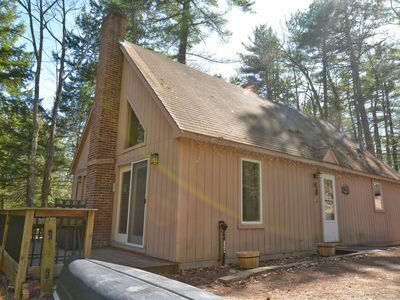 Conway Area Chalet w/ Mountain Views & Fire Pit! 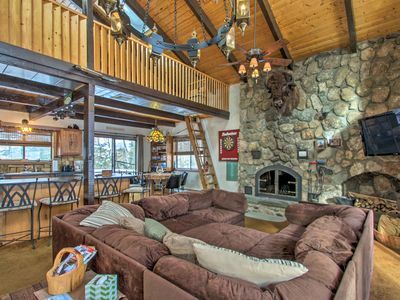 Amazing custom log cabin close to EVERYTHING!! 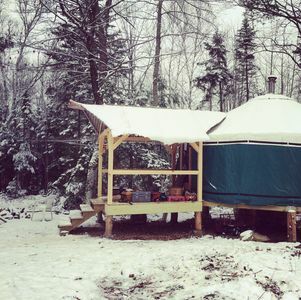 Your family getaway in the White Mountains of NH starts here! NEW! Bartlett Home w/ Fireplace - Near Story Land!